Amazon has pickup locations on college campuses where students can pick up packages and return items. Certain locations have special school benefits like free textbook delivery. In order for students to use these Amazon locations, they must activate their school's Amazon program online via an activation page. Does Free One-Day Shipping apply only to textbooks and school supplies? Does this cost anything? Is it a free trial? 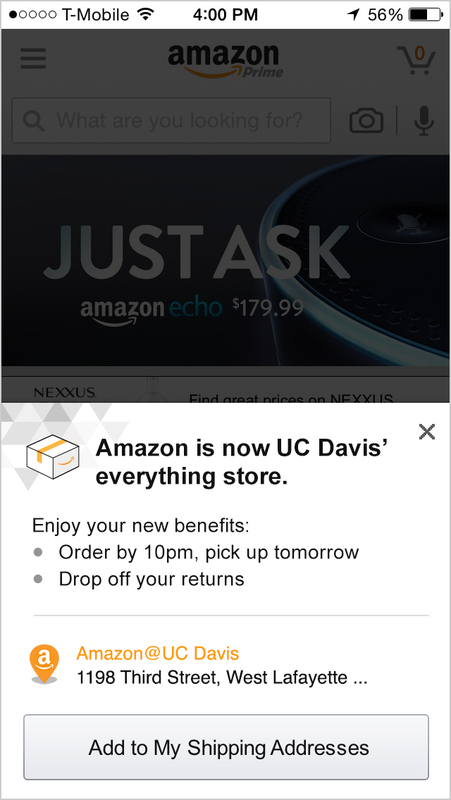 Do I need Amazon Student to use on-campus pickup? Can faculty and staff use this too? It was important for me to understand how this Activation Page fit in with the Amazon Campus ecosystem. I created a flowchart of how someone would enter the experience, what actions they could take, and where they would go afterwards. Once I understood the problems with the current page, I designed several versions and usability tested them using prototypes I created in Axure. The high-fidelity design below significantly increased user comprehension and is the one we ended up launching the redesign with.